9789048130795 | Springer Verlag, February 3, 2010, cover price $239.00 | About this edition: Multiobjective Shape Design in Electricity and Magnetism is entirely focused on electric and magnetic field synthesis, with special emphasis on the optimal shape design of devices when conflicting objectives are to be fulfilled. 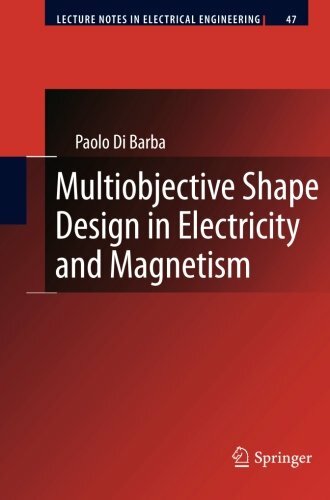 9789400731462 | Springer Verlag, April 6, 2012, cover price $239.00 | About this edition: Multiobjective Shape Design in Electricity and Magnetism is entirely focused on electric and magnetic field synthesis, with special emphasis on the optimal shape design of devices when conflicting objectives are to be fulfilled. 9781586030247 | Ios Pr Inc, May 1, 2000, cover price $125.00 | About this edition: This text is a collection of contributions covering a wide range of topics of interdisciplinary character, from materials to systems, from microdevices to large equipment, with special emphasis on emerging subjects and particular attention to advanced computational methods in order to model both devices and systems.